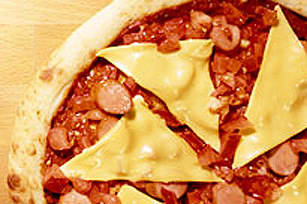 This pizza features all your kid's favourites. It's a quick and easy pizza with kid-appeal. SPREAD pizza crust with pizza sauce. Add wieners and tomatoes. BAKE at 450°F (230°C) for 15 minutes.